Uliginosa is a very pretty South American from boggy areas. However it runs underground and could come up a metre away from the original plant. I don’t like this kind of runner as it is doing things you are not aware of until it becomes difficult to get out. I think it is irresponsible if nurseries don’t tell you about its habits before you buy it. When you know and plan for it uliginosa is a beautiful addition to the garden. 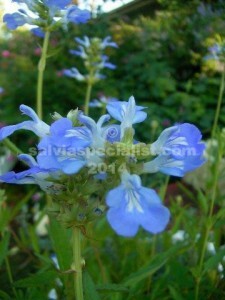 The stems up to 2m high are very willowy, the leaves narrow and the sky blue flowers in summer are very pretty. It should be cut down in winter and allowed to rejuvenate. In a watered garden it could be difficult to get rid of uliginosa but if it is in a hard dryish spot it might go willingly. It has been about a long time in Australia and worldwide. Nurseries offered it a lot because it is so easy to divide. Some people are nervous of salvias spreading because of experience with uliginosa. Unfortunately the British decided to give it a variety name recently of ’African Skies’ which is pretty dumb when it is from America!!!! so it has been called that in New Zealand and Australia by nurseries thinking they have a new plant. The name clashes with ‘African Sky’ a quite different and marvellous variety with African parents.